The Samsung Galaxy E7 runs on Android 4.4.4 KitKat enhanced with the TouchWiz UI. It offers graphical themes, a feature introduced with the A-series. However, this version of the software doesn't stray too far from the TouchWiz-y looks that have defined Samsung software throughout the years. You can catch a quick glimpse of the interface in the video below. Themes have made their way to TouchWiz but currently only four are available aside from the standard one. They change the wallpaper and icon pack, along with the animated transitions, but leave even Samsung apps unchanged. The lockscreen shows the time and date and offers a camera shortcut. You can also enable weather information and a second clock. A feature borrowed from Lollipop is that the more important notifications, like missed calls, now show up on the lockscreen. You can tap them then swipe at the bottom to unlock the phone and go to the relevant app. There's a private mode, and you can protect it with a Pattern, PIN or a Password. Private mode creates a secure section in the phone's storage, which can be used to store photos and other files. They are not accessible to users or apps unless Private mode is unlocked so you don't have to worry about somebody snooping on your files. The homescreen is typical TouchWiz, with a 4-icon dock on the bottom. You can have up to 7 homescreens, panes can be reordered and one is set as default, and can be cycled, unless you have Briefing enabled. Briefing is the leftmost homescreen aggregating your social news. You pick topics of interest and use "Read Later" services (Instapaper, Pocket or Readability) to pick articles on a computer and later read them on the phone when you have the time. The notification area is the familiar affair with a wide assortment of quick toggles. You can rearrange and hide them as desired, but the brightness slider (with Outdoors toggle, and no Auto mode as there's no ambient light sensor) is always visible. There are no S Finder and Quick Connect buttons to add extra clutter. If you have both SIM slots occupied, the SIM selector is always visible too. The settings menu has a selection of most used options that you can customize and search. That's invaluable since TouchWiz packs many features and digging around can be time consuming, while search allows you to jump straight to the relevant settings. Up to 9 big icon shortcuts on top can be user-selected, or you can remove them altogether. In the app drawer, the icons are presented as a customizable or alphabetized grid. You start with only two pages of apps, a modest number by Samsung standards, and you can disable or hide the ones you don't need. The app switcher interface uses the Lollipop design of a virtual rolodex. It only shows four apps at a time and has a task manager button and a kill all apps shortcut. On a 5.5-inch screen, Multi Window comes in handy. It allows you to use two supported apps at once in split screen mode (you can even use two instances of the same app). To go into split screen mode you need to tap on a button in the upper right corner of the app card in the app switcher. Additionally, you can swipe down diagonally from one of the top corners to shrink supported apps to pop-up windows, of which you can have more than two open at the same time. Pressing and holding the back button pulls a strip of apps you can you can open straight to pop-up windows. 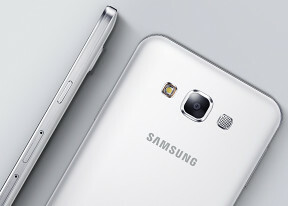 The Samsung Galaxy E7 features One handed operation which comes with three separate features. One handed input scaled down the keyboard and moves it to the side so you can reach all keys with the thumb of one hand. You can place a panel of on-screen alternatives to the hardware keys if you find reaching those hard. The all-in option shrinks the whole screen and puts on-screen buttons underneath so you can effectively use a smaller screen. The rest of the display remains black, so perhaps there may be even battery advantages. It's activated with a quick swipe-in-swipe-out motion from the respective edge of the screen your thumb is closer to.